@nd4reality OT I meant to respond to your post the other day where you said you had to keep going back to the contestant threads. Not sure what type of device/laptop you use, but I always have two window's open. Log in, copy the address line, open another browser and paste it in there. This way I have the window open where I'm posting, and the other window I roam around looking for things. Just don't use view new posts in the "working" window. NOTE: of the 33 guys released by ABC, Matt Dione, Joe Romeo, never made it to filming as were cut before filming began. 3/25: 3rd Rose Ceremony; ELIMINATED: JOEY JONES, BEN GRANGE, TYLER G....ELIMINATED ON GD PER SM ACTIVITY. CAMERON ELIMINATED AT ROSE CEREMONY PER SM ACTIVITY. We do have a few extra by past season now that they have started travel. And row 2 of the picture chart looks clean . No one eliminated. Normally past seasons have started at 30, Rachel's started with 31 and if we have things right, this season is starting at 31 as well. Hope we get some more pics soon to help fill in some gaps. Check on Dylan B's sm again and see if there is any activity other than his followers/following has changed a bit recently. Prior to Meet & Greet 33 guys: Brian, Joe R and Matt Dione gone. 30 remain. Meet & Greet RC: Joe B, Ryan, Scott and Thomas gone. 26 or fewer remain. Episode 2 during and at RC: Connor J, Luke S and Matt S gone. Edited per Auntie's info, Jonathan also gone by end of Episode 2. Therefore, 22 or fewer remain. Episode 3 during and at RC: Ben, Cam, Joey, Jonathan, Tyler G gone. 18 or fewer remain. 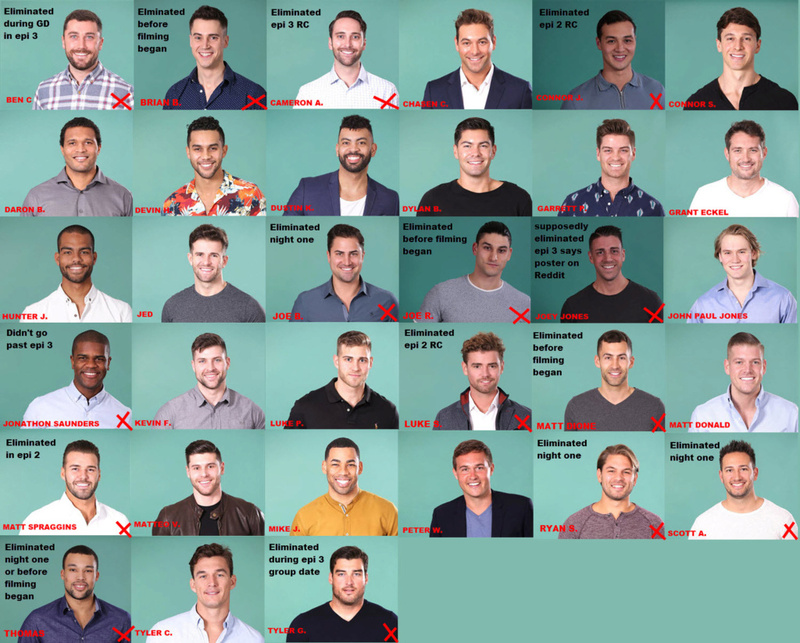 There was some discussion about whether Kevin and Luke P are still there, but if they are gone we have 16 remaining and going to Rhode Island beginning Episode 4, which is right in line with Rachel's season beginning Episode 4. So do we anticipate a RC taking place now ? @nd4reality wrote: So do we anticipate a RC taking place now ? I don't think so. Last RC was Saturday 4/6. They traveled from Scotland to Latvia and maybe one day of rest? Scotland is 8 hours ahead of US pacific standard time, Latvia is 10 hours ahead. I looked at flights from Scotland to Latvia...about 2-3 hours but most flights have stop overs and shortest time was about 5-6 hours. I'm thinking they may have had a travel day and a day off Sun/Mon April 7/8. One on one date was yesterday per RS and others. Today is Group date. So tomorrow would be another one on one with RC probably Friday April 12. This is my best speculation. @pavalygurl Thanks for the update! I just looked at the 1st pg approximate schedule in the stickied thread and there it said 10th April so asked.